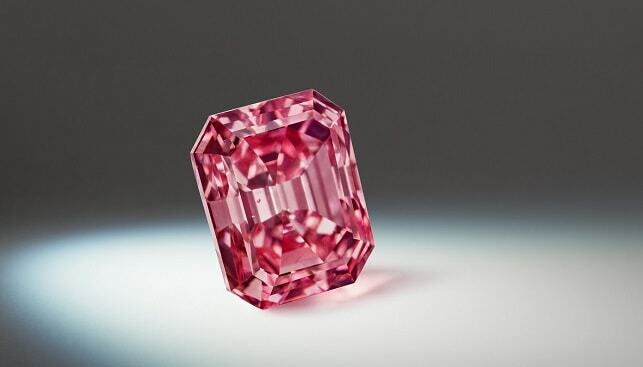 The 2018 Argyle Pink Diamonds Tender will have a historic diamond in the mix: Rio Tinto announced that the Argyle Alpha™, the largest Vivid Pink diamond in the history of its Argyle Pink Diamonds Tender, will be auctioned. The 3.14 carat polished emerald cut diamond, which was unveiled in Sydney, Australia, last week, is part of 63 rare pink, red and violet diamonds in the tender. The collection “will be showcased in Sydney, Hong Kong and New York with bids closing on 10 October 2018”, according to a press release. The 2018 Argyle tender is named “Magnificent Argyle”. The 63 diamonds to be auctioned weigh a total of 51.48 carats – including five Fancy Red diamonds, two Purplish Red diamonds and three Violet diamonds. At the center of the collection is the the Argyle Muse™, a 2.28 carat polished oval diamond, and the largest purplish red diamond ever offered at tender.